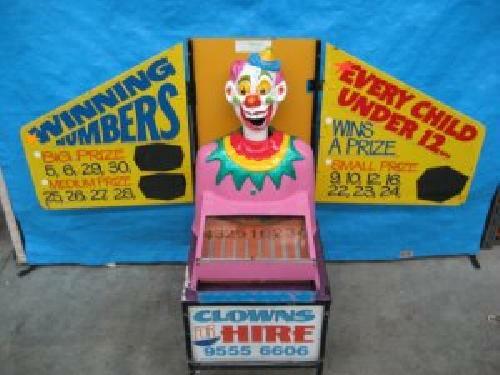 Fun for Young and Old with Our Laughing Clown Hire in Melbourne! For years, laughing clowns have remained a timeless fixture of any fete or carnival. This simple game keeps people coming back for more, because it’s impossible to have a bad time when playing the laughing clowns. All the youngsters at your fete, fair or festival love to play this carnival game because every child player wins a prize, and we supply lots of children's fairground style prizes to start you off. A variety of single, double and triple laughing clowns are available for hire. All you need is a power point to turn the heads and a trailer or large van for pickup. If you’d like to find out more information about the requirements for our laughing clown hire in Melbourne, please don’t hesitate to contact our team today. Each of our rides is covered by Public Liability Insurance and are regularly checked by a qualified engineer and electrician, as well as being regularly audited by Worksafe Victoria representatives. Your safety is of the utmost importance to us, as well as making sure your event is a great success. Your next event is in safe hands with our amusements suitable for the whole family! If you have any questions regarding any of our offering services or products, or if you’d like to book one or more of our amusements, get in touch with our friendly team! You can call us on (03) 9555 6606, or use our simple online contact form and we’ll get back to you as soon as possible. Needs Trailer or large van for pickup. 1 x 10 amp outlet within 20 metres. All the youngsters at your fete, fair or festival love to play this carnival game because every child player wins a prize. We supply lots of children's fairground style prizes to start you off. Single and double laughing clowns available. Needs a power point to Turn the heads.